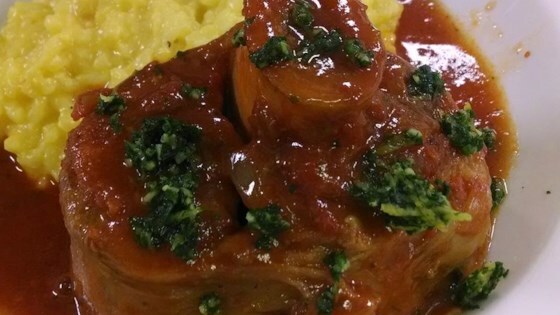 "This recipe is a traditional but simple way of cooking Osso Buco (veal shanks). The white wine is a must in this dish." In a small bowl, mix together the parsley, 1 clove of garlic and lemon zest. Sprinkle the gremolata over the veal just before serving. I must be in the minority after looking at the ratings for this dish.... I usually love Osso Bucco, but after making this 2x, it has a very different flavor that I just didn't care for. I loved this recipe, but I browned the shanks on both sides in a skillet then transferred them to a crockpot and cooked them for @ 8 hrs. it was so tender!! This is a very good recipe. The only problem is that it isn't actually a "Traditional" ossobuco. The Italians weren't introduced to tomatoes until after this recipe had been invented.